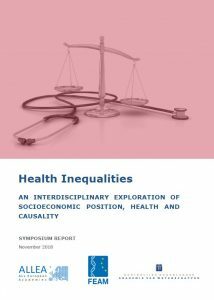 ALLEA, jointly with the Federation of European Academies of Medicine (FEAM) and the Royal Netherlands Academy of Arts and Sciences (KNAW), published the report “Health Inequalities: an interdisciplinary exploration of socioeconomic position, health and causality” today. The publication summarises the main findings of a recent symposium organised by the KNAW in Amsterdam. The report is part of a project under the tripartite partnership of ALLEA, FEAM and KNAW, which strives to explore the topic of health inequalities using the evidence base and knowledge provided by a range of disciplines such as public health, genetics, economics, demographic studies and other social sciences. The initiative seeks to identify and comprehend how different life factors can affect our health and wellbeing, and assess the impact they may have on our socioeconomic position (and vice versa). It pays special attention to investigating causal effects of socioeconomic position and health, since different disciplines often use different sets of methods and come to different conclusions. To align the different approaches, an interdisciplinary symposium was organised in Amsterdam on 24 May 2018 to convene scholars, experts and interested stakeholders. Participants and speakers addressed the socioeconomic disparities and introduced the breadth of various takes on the topic followed by a vibrant panel discussion. The discussants explored the evidence and perspectives on the issues raised in the project discussion paper. This report summarises the discussions and scientific findings of the symposium and delivers a concise picture of the current situation. It also reviews the current state of the art in place within the relevant disciplines with multiple references to important studies and research papers that have shaped the discourse around health inequalities. ALLEA is delighted to contribute to this joint endeavour as a network with wide membership in the Council of Europe region. Our Member Academies are committed to research excellence and cross-border collaboration as is the case with KNAW that has successfully steered this project and the work of its Scientific Committee.